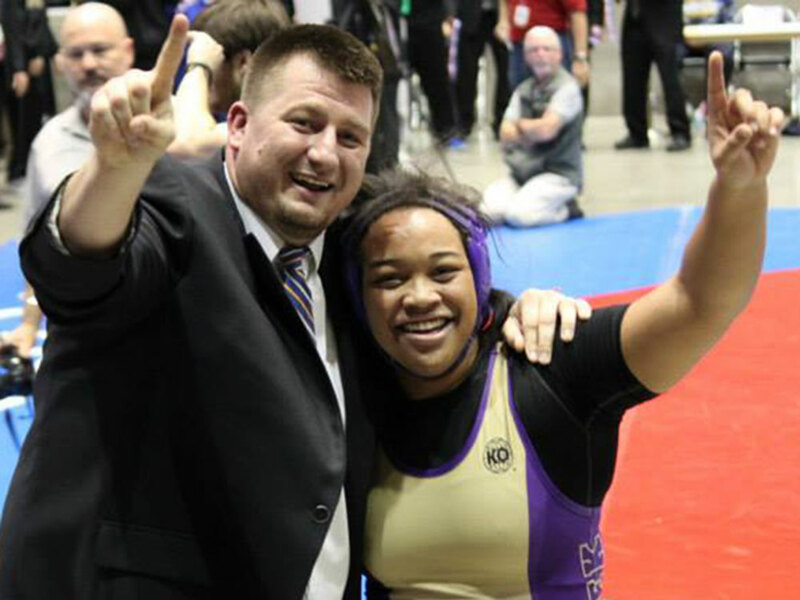 TCHS wrestling coach Brent Wasche (left) stands with state champion wrestler Rachel Bridges (right) following her victory in the 215-pound division of the UIL Class 6A State Wrestling Championships on February 21 in Garland. Bridges won the girls 215-pound division of the UIL Class 6A State Wrestling Championships on February 21 in Garland. Now state champ, Bridges shattered her bracket at the tournament by dominating and pinning her first three opponents. Even more impressively, she pinned her first and third competitors within the very first round. Her fourth match, the state finals, went into triple overtime. In that nail-biting round, Bridges and her opponent both got a one point escape making the score 1-1. Skipping to the second overtime where the nest points were awarded, Bridges was on bottom and managed to escape and go up by one making the score 2-1. The third overtime was as suspenseful as any. Bridges had her opponent on bottom using her position to turn her opposition with a fierce bump back cradle. Bridges was awarded by the referee with two points for near fall making the score 4-1. Bridges out fought her opponent for the rest of the third overtime and closed the deal winning the state championship 4-1. Bridges has been successful in her two sports: football and wrestling. Her advice to fellow TCHS students looking for success is simple.